Best virus free Software on the net!!! Create your own 3-D Header!! Save them to your disk FREE!!! & unique stained glass and other web page enhancing elements you can add to your web sites. This is a new Gallery and will be growing in content. Your Site can be as simple or as complex as you wish. You may have as many pages as needed. Price very negotiable for Web Sites over 6 pages and appropriately so depending on complexity. You may have as many images as desired. 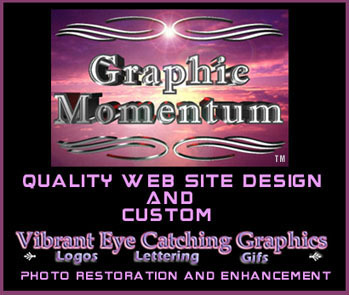 Graphic Momentum also supplies image resources for other web masters and builders. incorporated into the creation of your web site! For aspiring novice to the expert WebMaster!